American officials tell Netanyahu he won't get a better military aid package from Obama's successor. Talks between Israel and the United States on a new military aid package have become stuck as the two sides try to strong-arm one another, Haaretz revealed on Sunday. The current American aid package to Israel is set to expire in 2017, and in November it was reported that Israel made an initial request for its annual defense aid to increase to as much as $5 billion. Israel wants $5 billion per year in military aid for 10 years, for a total of $50 billion, congressional aides said at the time. But on Sunday, Prime Minister Binyamin Netanyahu said at the weekly cabinet meeting that if Israel's security needs would not be met, he would not sign a deal and would instead wait for the next president to take office in January 2017. According to Haaretz, senior U.S. officials reacted angrily and warned that the budgetary situation would not improve, and that Israel would not get a better deal with the next president. "Even as we grapple with a particularly challenging budget environment, this administration's commitment to Israel's security is such that we are prepared to sign an MOU [memorandum of understanding] with Israel that would constitute the largest single pledge of military assistance to any country in U.S. history," one official told the newspaper. "Israel is of course free to wait for the next administration to finalize a new MOU should it not be satisfied with such a pledge, but we would caution that the U.S. budgetary environment is unlikely to improve in the next 1-2 years and Israel will certainly not find a president more committed to Israel's security than is President Obama," the official warned. The official further stressed that talks are "taking place in the context of a challenging budgetary environment in the United States that has necessitated difficult tradeoffs amongst competing priorities including not just foreign assistance and defense but also domestic spending." According to the official Israel currently receives over 50 percent of the total foreign military aid the U.S provides around the globe. "Despite these [budgetary] limitations, based on extensive consultations with Israel on its threat environment and in-depth discussions within the U.S. government regarding Israel's defense needs, we are confident that a new [memorandum] could meet Israel’s top security requirements and preserve its qualitative military edge," he said. 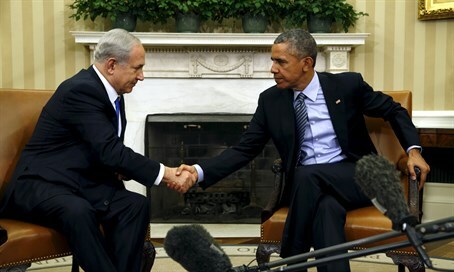 In 2013, during his visit to Israel, President Barack Obama indicated that Israel and the United States were opening talks on extending the American military aid to the Jewish state beyond the end of the current agreement. Netanyahu later put the brakes on aid talks with Washington in the run-up to the Iran deal that was reached in July, signaling his displeasure with the negotiations. Subsequently, Israeli officials indicated that Netanyahu was ready to move beyond his rejection of the Iran deal and re-launch talks with Washington on the aid package. Since that time, according to the Haaretz report, there have been three rounds of talks on the aid before Netanyahu’s comments on Sunday. "From the $20.5 billion in Foreign Military Financing to the additional $3 billion in missile defense funding the United States has provided under his leadership, no other U.S. Administration in history has done more for Israel's security," the White House said. According to the report, last Thursday, an American delegation led by Yael Lempert, the Special Assistant to the president and Senior Director for the Levant, Israel and Egypt at the National Security Council in the White House, who arrived in Israel to hold a third round of negotiations on the matter. Over the past three days, the American team held discussions with a team of counterparts from the national security staff in the Prime Minister's Office and from the Defense Ministry, the Israel Defense Forces and the Foreign Ministry. The main topic of discussion in the talks was the size of the aid that the United States would provide Israel and the conditions on its use. A senior Israeli official who participated in the cabinet meeting but asked not to be identified due to the sensitivity of the subject said the contacts with the American administration are continuing but "nothing has yet been finalized and it will take more time." Another senior official who also participated in the cabinet meeting added that, despite the three rounds of negotiations, Obama's intervention will be necessary to achieve a breakthrough. "It's not a subject for staff, but rather for decisions by leaders," he said. Next month, notes Haaretz, the contacts between Israel and the United States on the security memorandum of understanding are expected to be stepped up a notch. Defense Minister Moshe Ya'alon is expected to visit Washington at the beginning of March to meet with his American counterpart, Ashton Carter. About two weeks later, Netanyahu will come to Washington to attend the conference of the pro-Israel lobby AIPAC, the American Israel Public Affairs Committee. In all probability, he will also meet with Obama in an effort to achieve a breakthrough in the talks.